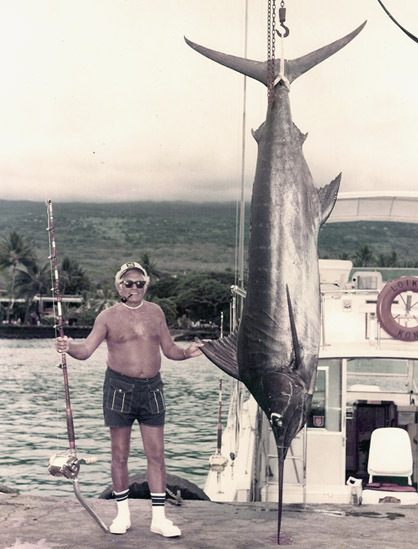 My grandfather, Sol Scherer, catching 'the big one' in Kona, Hawaii, in 1977. I’m suddenly back in the US to say goodbye to one of my favourite people on this planet – my grandfather Sol Scherer. I typically only get over to the States once a year, so I was lucky enough to have just seen him a few weeks ago for a family gathering in Los Angeles. He was his usual happy, generous self, playing with his great-grandchildren, giving away dollars that he folded into bowties, and amazing me by still looking fit and flying across the country at 93 years old. Then, suddenly, weeks later, has was diagnosed with an aggressive form of cancer, and before any of us even had time to process his situation, he was gone. It’s often that when you write a eulogy about a person, that you try to think of a good story to tell. With my grandfather, it was the opposite problem – there are so many stories, it was nearly impossible to decide what to pick. My grandfather died a gentle, happy man, but my earliest memories of him were of a strong, even imposing, man. He had big hands that I was convinced were permanently stained black from working in the oil business – I remember my amazement, years later in his semi-retirement, when he first showed up with clean hands. It was like he had turned back the clock 30 years, at least from the wrist down. When I was a kid, we’d go to his gas station on Coney Island, where I loved sniffing the gas pumps – to my mother’s horror – and we got to pat all of the big dogs he had running around there… except, that is, for the ones that might bite. My favourite game was when he’d have the dogs jump up on my parents’ car and stand on the roof, which would make my mother scream. He and I both though it was hilarious. I was my grandfather’s favourite grandchild. I know because he told me so. Of course, when I was with my cousin Stefanie in California last month, she told me that he told her that she was his favourite. I’m guessing he had a lot of favourites – he was that kind of guy and his heart was big enough to be partial to them all. I live in Sydney surrounded by water, and I think my love of the ocean comes from him. There were so many days going out on his house boat, where I’d be fascinated by the scary, prehistoric-looking horseshoe crabs, curious about the fishing lines we towed behind us, and amazed that we could sleep in bedrooms above the water. There’s a photo in my grandmother’s living room with him wearing his sailor’s cap and stylish dark sunglasses, and he looks like he could have been the yacht captain for the Onassis family – we got so used to the jolly face of his last decades, I almost forgot how handsome he was. Grandpa Sol was someone who always kept busy. There was the Coast Guide volunteering, the bowling leagues, golf, the constant chores and tinkering. At family occasions, he never saw a challah that he didn’t like, and he was always among the first to hit the dance floor. He helped teach me how to play chess, beaming with pride the first time he lost, and how to shoot a pool stick with only one hand. We drove around in trucks together making deliveries for my dad’s textile business, carrying a billy club or baseball bat in the cab when we made deliveries in dangerous areas like Williamsburg, in case someone tried to rob us – times have changed, huh? He was also a bit of a style guru in his own way. There was the handlebar moustache, the bolo ties, the cowboy hat, the boat captain’s cap – they all looked fantastic on his ever-present tan. I probably got the most quality time with my grandfather after he and my grandmother moved to Florida. I was in college and took advantage of the free hotel in Delray Beach during spring break. We loved being with my grandparents – they paraded us around to the other retirees like we were rock stars, lent us their car so we could drive it to the Boca nightclubs, and entertained us with their bickering, which was like watching a free Punch and Judy show. My brother Andrew and I would go to the pool, intent on checking out any good-looking female grandchildren, and my grandfather would go around and bring over options, one after the other, against our mild protests. With his cheeky smile and charisma, it was like shooting fish in a barrel, even if we weren’t always impressed with the bounty. Call it “catch and release”. He’d also joke about his own options, teasing my grandmother that he was going to trade in his 75-year-old for three 25s. Another of my favourite memories is of being with him in Florida for dinner, when he told one of his many, many awful, painfully-not-funny jokes, as we know he liked to do early and often. He finished and we grimaced, but then he started to laugh, then cackle, increasing, until his face turned red. He kept going, and soon enough we all found ourselves laughing, to the point of crying, merely from seeing him so amused at himself. My grandfather was a wise man. It didn’t come from book knowledge, or from cunning, or from ambition, but from something far more important. He taught me that the key to life is to enjoy life every day, to selflessly love your family and those around you, to not take yourself too seriously, and to laugh at any given opportunity, no matter what anyone else thinks. He also taught me that there’s no reason to not enjoy a bowl of ice cream, that you can still flirt with young girls at 90 years young, and that a smile is worth a thousand words.